Become a Sustaining Contributor TODAY! In 2019, JUMP will continue to explore community initiative’s which support shared effort and resources to reach out and meet families where they are at. If you'd like to support the important work that JUMP does for approximately 2200 householdss a year, please consider making a one time or reoccurring tax-deductible donation. April 15th UPDATE annual Spring Campaign Fundraiser "HELP!" 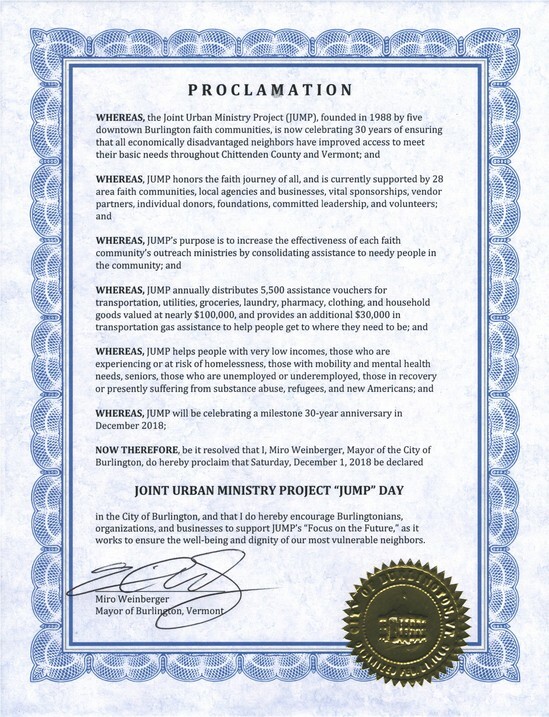 We are following up during our annual Spring Campaign to announce that the Joint Urban Ministry Project (JUMP) still needs your help to reach our goal $25,000. JUMP has raised $16,000. Your assistance made it possible to keep JUMP’s doors open to help children and adults with basic needs and provide a place that can help restore the sense of self-worth that poverty often steals away. 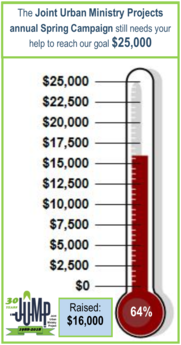 JUMP and families, hope you will continue your support by sending a gift today to help the Joint Urban Ministry Project raise $9,000 more and reach our goal $25,000. Thanks to our generous and thoughtful supporters JUMP just concluded celebrating its 30 years of operation. Now JUMP focuses on the future and ask you to “Go with JUMP” the next 30 years, starting with our annual Spring Campaign. Once again, during our annual Spring Campaign JUMP will reach out to its loyal supporters asking for help in assisting our neighbors in need. Their many stories, helped JUMP realize how much transportation creates a barrier for the working poor and homeless, whether getting to and from work, making appointments, getting medical help, or taking advantage of cultural events our community offers. As a result, JUMP has focused on transportation assistance as its number one priority for the future. In 2018, clients requested 5595 vouchers valued at $101,430. Transportation assistance accounted for one-third of all assistance offered, and gasoline was almost 80% of that transportation total. Your support of JUMP makes a real difference and empowers our most vulnerable population, in finding work, achieving freedom and independence in their mobility, and becoming a more active member of our community. This annual Spring Campaign, please give and give generously to ensure families find help to meet basic needs and increase transportation assistance support where and when it is needed. In gratitude, on behalf of all JUMP clients. To learn more about JUMP during our Spring Campaign, please view the NEW video: JUMP "Focused on the Future"